The Gallup State of the Global Workplace report was released recently, containing employee engagement results per country. The results are generally pretty dismal, an indictment on the prevailing cultures in our organisations. In most sub-Saharan African countries, formal employment for an employer is still relatively rare; many residents work at subsistence farming or in some other form of small-scale self-employment. Among 26 countries and territories in sub-Saharan Africa included in Gallup’s 2011 to 2012 employee study, 19% of respondents overall indicate they work for an employer, the lowest proportion among all global regions. Among employees, 10% are engaged, while 57% are not engaged and 33% are actively disengaged. The last figure is on par with the Middle East and North Africa region for the highest in the world. In only three countries — Botswana, Nigeria, and South Africa — did the surveys capture enough respondents who worked for an employer to report country-level engagement results. South Africa has one of the highest percentages of actively disengaged employees in the world. Only among the most highly educated Africans and those in professional job categories is the proportion of engaged employees similar to the proportion of actively disengaged employees. In most other cases, actively disengaged employees — those who are the most negative about their jobs and liable to spread that negativity to coworkers outnumber engaged employees by at least 3-to-1. I find it really sad that in countries like SA that struggle with high unemployment rates, the people who do manage to find a job are so miserable. The unrest and volatility in the mining industry has shown us that active disengagement, unhappy employees and toxic cultures are seriously affecting the bottom line of South African companies (and the health of our economy). Leaders can no longer afford to hand over the responsibility for fostering healthy corporate cultures to HR or OD. In his book Boundaries for leaders, Dr Henry Cloud writes that leaders are “ridiculously in charge“, i.e. there is nothing in their organisation’s culture that leaders don’t either allow, or play a part in creating. Some of the causes for pervasive disengagement require senior leadership’s commitment to be resolved. For example, research shows that among other factors, one of the main factors at play in causing disengagement is a lack of purpose; people in large organisations no longer have a sense of meaning or purpose in their work. Authors like Patrick Lencioni in his book The Advantage insist that organisations have a higher purpose, beyond simply making a profit, to positively impact on society in some way. Connecting to this purpose provides meaning to people across all levels in the organisation. It’s the responsibility of senior leadership to define and communicate this purpose and ensure that people understand the part they play in achieving it. Other issues that may require large-scale intervention in organisations include performance measurement and incentives. Unintended consequences often result from measuring the wrong things: we often incentivise behaviors exactly opposite to those we seek to cultivate. Changing organisation-wide systems and processes requires senior leadership’s commitment and buy-in. It’s time for leaders to make employee engagement and a healthy culture a strategic priority that they are as committed to as profitability and creating shareholder value. Dealing with people issues can be complex, and changing culture is notoriously hard – it is understandable that many leaders feel ill equipped to deal with this complexity and defers to the “experts” in HR. 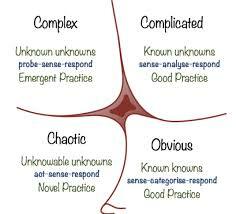 Complexity theory offers new approaches that could give leaders new insight into leading change with lasting results. No matter how you look at it though, it’s time for leaders to realise that “the soft stuff has become the hard stuff” and to roll up their sleeves and get their hands dirty in partnership with OD & HR practitioners. Previous Previous post: Regime Shifts: a new way to think about culture change?